The Choppiness Index is a volatility indicator developed by Australian commodity trader Bill Dreiss to indicate whether a market is trending or ranging. Values range between 0 and 100, with low values indicating a strong trend and high values signaling consolidation. Colin Twiggs' free weekly review of global markets will help you identify market risk and improve your timing. Values above 61.8 signal consolidation. The Choppiness Index does not predict future direction, it is simply a measure of current trend status. 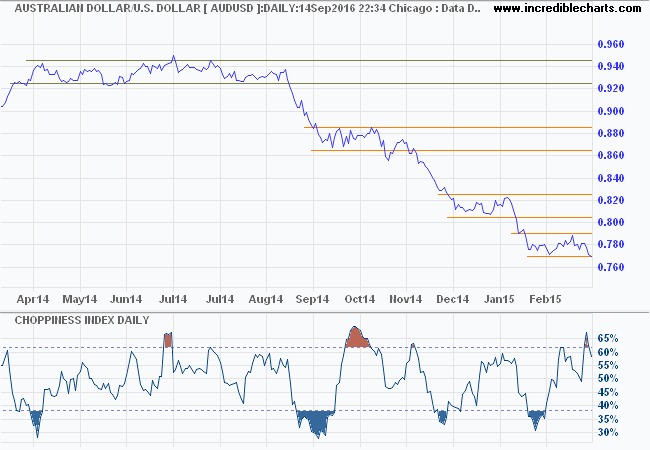 A daily chart of the Australian Dollar/US Dollar (AUDUSD) is plotted with 14-day Choppiness Index. While the Choppiness Index does highlight the broad consolidation in 2014, oscillating above the 38.2 trend treshold for several months, crosses below 38.2 [marked in blue] often lag the actual trend. I think one could do better from a visual inspection of the chart. The default setup is 14 days. Select Indicators and Choppiness Index in the left column of the Indicator Panel. See Indicator Panel for directions on how to set up an indicator. To alter the default settings - Edit Indicator Settings. To amend indicator colors, open the legend by clicking "L" on the toolbar or typing "L" on your keyboard. Adjust individual colors by clicking on the color patches next to the indicator in the legend. Sum True Range for the past n periods. Calculate the lowest TrueLow for n periods. Subtract from the highest TrueHigh for n periods. Calculate Log10 of the result then Multiply by 100. Divide the result by Log10 of n.